Ever since Google added “OK Google Everywhere“, I am constantly barking orders at my Nexus 5. This rarely happens in public, but when I’m at home, my phone is generally resting on a Qi charger near the couch, or a Qi charger near my bed, so it’s always listening, even when the screen is off. Some of my most common tasks are checking the weather, creating calendar events, creating to-do items, setting reminders, and sending text messages – all of which can be done through voice commands. It’s not just become the lazy way of doing something, but often it’s actually the most efficient way – Google’s voice recognition software has become good enough that I rarely have to correct it. However, until I had an Android Wear watch, my use of voice commands in public was basically non-existent. Now that I’ve had one for almost two weeks, I continue to be surprised by is just how comfortable I’m becoming whispering short commands to my wrist – I’m even reaching the point where there are times I’d rather dictate a quick text message through voice than on my phone’s keyboard. I thought it would look silly and obvious, but for the most part, people aren’t even noticing when I do it. It’s certainly more subtle than the act of taking my phone out of my pocket every time I want to perform even a trivial task. Even when people do notice, it somehow feels less rude than taking out my phone, since they can tell what I’m doing – no, I’m not ignoring you to text my friend, I’m writing down what you said so I remember to look it up later. It’s also proven to be invaluable when it comes to remembering things that only come to me on a bike ride or a run – ideas or tasks that, in the past, would have likely been forgotten by the time I got home. 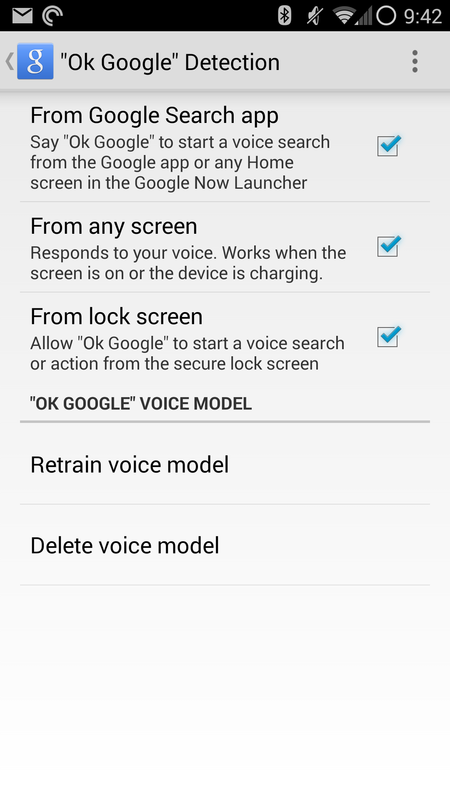 Of course, there are still large functionality gaps – common tasks that I still can’t do through voice commands. I can’t change my Nest’s temperature. I can’t arm or disarm the alarm system in my house. I can’t start a particular podcast. I can’t start a Hangout or Facebook Messenger conversation, only an SMS conversation. 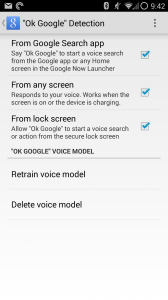 Some of this will come if and when Google opens up voice commands to third-parties, the rest will come as Google Now becomes more and more aware of context – both in regard to where I am and what I’m doing, as well as the last few commands I’ve given it. We are tantalizing close to being able to do almost anything with our voice, though – and as we get closer and closer, I think wearables are going to be come more and more important. I don’t necessarily want microphones and speakers all over my house, but that becomes entirely unnecessary when I have a microphone strapped to my wrist. Android Wear still has a lot of kinks to work out, especially in the voice command area, but the foundation continues to be incredibly solid, and when it does work flawlessly, it feels like I’m in the future. If it’s not enabled yet, Android Police might have the solution for you. I believe it requires Android 4.4 or higher, however. Personally, I find it’s more useful in the car, as that’s when hands-free operation is most essential. The best part about this is that it will naturally continue to get more and more useful as Google expands their Voice Command API, which is sure to happen now that Android Auto – which by its nature is heavily voice-command centric – is on the horizon. In its current form, it can already do quite a bit, but I can envision a time in the near future when I can just say (for example) “OK Google, continue podcast” and it will open up PocketCasts and hit play, or “OK Google, set Nest to away” could turn my A/C down when I leave the house. The possibilities are almost more exciting than the current reality, and in some ways, it’s even making me question my need for a after-market Android Auto system, especially if I can get most of the same functionality from a Nexus 5, Google’s voice commands, and an AirDock. The downside, of course, is that support is limited for certain devices, presumably because of processor limitations. Ideally, Google can eventually enable “OK Google” even when the device isn’t charging, depending on whether or not your phone’s processor supports that sort of lower-power mode. Another minor issue I noticed is that sometimes the device takes a good 3 or 4 seconds to respond to the voice command, especially if you’re trying to demo it for some co-workers…cough, cough. Between this functionality and the upcoming Trusted Bluetooth functionality in Android L, my Nexus 5 is finally adopting some of the best features of the Moto X.